TOUGHSwitch PoE PRO is an industrial-strength, 8-port Gigabit switch with 150 watts of power capable of powering 24V or 48V devices. Output voltage is controlled by the software. Introducing the Advanced Power over Ethernet Controllers, TOUGHSwitch? PoE from Ubiquiti Networks. 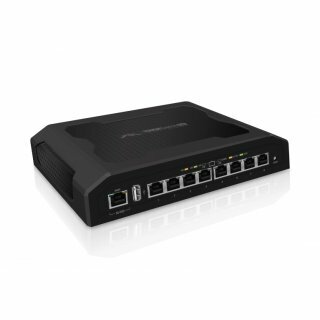 TOUGHSwitch PoE delivers reliable passive PoE and fast 10/100/1000 Mbps connectivity to attached Ubiquiti devices and other devices that support passive PoE. To connect your PoE devices, simply enable PoE in the easy-to-use TOUGHSwitch Configuration Interface. Each port can be individually configured to provide PoE, so both PoE and non-PoE. TOUGHSwitch PoE allows network architects to design cleaner, less cluttered deployments. TOUGHSwitch PoE deployments increase efficiency and greatly reduce potential failure points ? resulting in faster installations and less maintenance and troubleshooting. TOUGHSwitch PoE provides a user-friendly configuration interface designed for efficient setup and control. Accessed via a secured management port and web browser, the TOUGHSwitch Configuration Interface provides intuitive management with a virtual view of the ports, showing physical connectivity, speed, and PoE status.